Upon inspection, the tire was an ultra light one that perhaps ought not be on the rear tire. Both Charlie and I had legs of jelly on this ride. Pollen made it hard to feel strong…we were dosed, and dozed as soon as we stretched out in the (tick-filled) grass. “What does she mean, ‘extinct’?” you might ask. 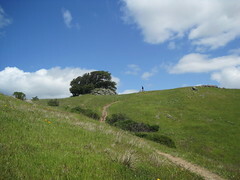 The tiny, sinous flower-lined wiggle that constitutes the route to the ridge has been designated (with neon flags all over the place) as a future “multi-use” trail” by Marin Co. OSD (I think that’s the correct agency). Our mole told us about the impending changes. We’ve already been deeply chagrined in the last five years by the grant-funded assault on the tiny frog-pond waterfalls in a (once) hidden gem known as Little Carson Valley. Biker-hatin’ MMWD constructed bridges, fences, signage and ‘improved’ trails that attract tenfold the number of visitors (with the aid of outdoorsman Tom Stienstra who reports on all the lost crannies in the Bay Area) and their dogs into the habitat. Oh, and they have volunteers who sit there each day during frog fornication season to make sure the newly-created horde stay a respectful distance. I used to hide out at the falls for entire days, with not a soul coming past. Tempting to go today–it’s raining. Face it…change is inevitable, and if you can pay a horde to dig a six-foot wide trail that suits ‘multi-use’ (as if every single user–horse, hiker and biker had to pass one another simultaneously) with free funding, why, it’s employment. And employment is what it’s all about. ~ by jacquiephelan on April 20, 2010. Tags: "Little Carson Falls", "Loma Alta"